Please Note: This is a deodorant, Not an antiperspirant! Out of stock. Should be back in stock end of April! Sorry for any inconvenience! All Natural Deodorant! Stay stink free longer with better ingredients! All of our ingredients were chosen for their known effectiveness in de-stinking!😆 We use Organic, Natural Shea Butter, rather than Coconut Oil as our base quite simply because Coconut Oil is a "4-5" on the comedogenic scale! If you are unfamiliar with the scale, it is simply the "clogging your pores" scale, and goes from 0-5. 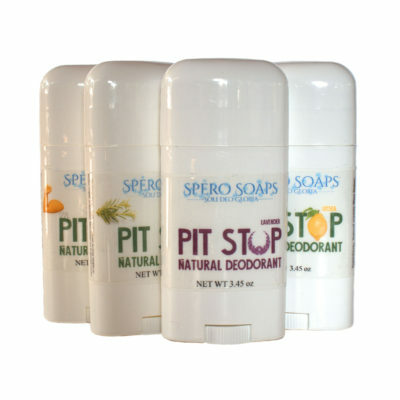 Clogging our pores is what we want to avoid with Natural Deodorant, not exacerbate! This is not quite the perfectly smooth texture you may be used to in some deodorants. We use completely natural ingredients, and thus are limited in the "feel" factor.😉We won't use ingredients like propylene glycol which give a smooth feel. But we think you will agree, it is well worth it to find a deodorant that actually works, without clogging your pores! And, with this latest improvement, we just about hit the store-bought textures! A version without Beeswax should be available soon in two of our scents. Everything else has been reformulated to excellence, no beeswax is still in testing. We are hoping to introduce the non-beeswax version by the end of May. Lavender is a light floral scent, Cypress Tea Tree has a woodsy scent, Litsea is a lemony scent, 4 Thieves is the traditional Clove/Cinnamon/Citrus scent.